Opening with several candid shots of Sun Ra donning full afro-futurist regalia in Oakland, filming the quintessential Space is the Place, Space, Interiors and Exteriors, 1972 finds Sun Ra himself in the foreground. An interesting choice, really, due to the fact that a large majority of the book focuses on Ayé Aton’s murals, painted primarily on the walls of Chicago’s south-side in the early 70s. 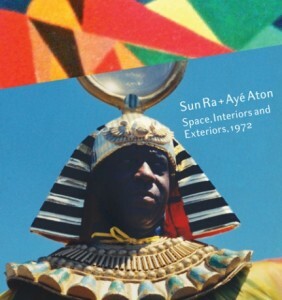 But this choice makes sense, as the brief essay included in the book lets us know, as it was the overpowering figure of Sun Ra that brought a focus to Aton’s work. Two brief essays in the book present this biographical (this mythical) information before treating the reader to a gallery of Aton’s murals, photographed, often obliquely, on Polaroid film in Instant film has never been the most archival film available; in these Polaroids it’s clear that colors have faded, that the precision of the film’s chemical reactions, etc, is far from precise. The material degradation adds a level of entropy to the aura the images create. While the introduction asks us to imagine rooms where entire walls are painted with fluorescent paint, the Polaroids reveal rough gestures in muted colors. With time everything fades. But the suggestion, the consideration, is a fascinating one. As another essay points out, none of the photographs of Aton’s murals depict people in front of them, they are isolated in space, often even destabilized away from their position on walls, embedded in the flatness of the picture plane. In the late 1950s Sun Ra started calling his music “space music” because ” the music allowed him to translate his experience of the void of space into a language people could enjoy and understand” (Wikipedia). With these photos, the viewer is floating in a void of colors long faded. The dream is dead, and I wouldn’t be surprised to find most of these murals either painted over or felled with buildings during destruction. My favorite mural, documented by a square Polaroid stamped with the month of “January” but bearing no year, finds a ram’s head above four staggering lines of grey, set within a large silver/white star-burst, across a field of pinks and oranges with black accents carrying through the field. The nothingness of the image plane is violated by a minor intrusion: that of a golden chandelier, hanging from a white ceiling. The reality of the murals becomes uncanny. This is a step towards a necessary mysticism, used by Ra and others to strive towards freedom, borrowing Egyptian symbols and steeping them in Biblical revisionism, a reality that allows the oppressed a sense of revolution. Space is the place, space is the place. The field turns into colors and every man and woman is wearing a costume that disorients. It’s after the end of the world–don’t you know that yet? In 1968, Kenneth Anger visited the great pyramids of Egypt with a cavalcade of junkies, musicians, artists, and magicians. Costumes were brought. Anger’s greatest film, Lucifer Rising was filmed. Problems followed. 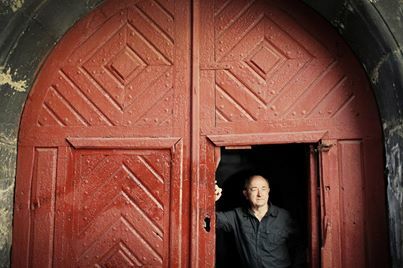 The film eventually was released and has been recognized for its brilliance. Sun Ra, on the other hand, refuses to just make his film. The costumes were part of life. Life was revolutionary and within this revolt there was a refined aesthetic insistence. Aton’s murals carry this aesthetic insistence further, into the banalized reality of those who don’t have the freedom to live in Sun Ra’s world permanently. The murals serve as a reminded. Until recently, there was only one memoir, that isn’t even a memoir, I truly loved—an essay by Cheryl Strayed called The Love of My Life which originally appeared in The Sun. I read that essay often because it is unbearably intimate, the writing is impeccable, and the essay, the memoir, the writing speaks to something greater than the story being told. I don’t read a lot of memoir which is kind of strange because I am nosy. I love reading personal blogs and I’m fairly obsessed with reality TV where I can witness unbearably intimate moments in people’s lives even if they (and I) are fully aware the subjects are choosing which intimate moments to expose. Memoir is much the same way. Like reality TV, a memoir doesn’t provide the reader with unfettered access to a writer’s life. That access is measured; it is controlled. We may learn private, intimate things about someone’s life but only because they want us to know those things. There’s a deceptive quality to the honesty of memoir. 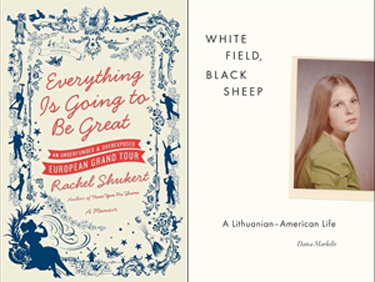 Even though I find similarities between memoirs and one of my favorite indulgences, I have long stayed away from reading memoirs because I haven’t quite understood what compels people to divulge their secrets. It’s one thing to dress the truth up as fiction, but to share the truth as truth is another matter entirely, one that confounds me. I have no idea how to review a memoir because you’re not only reviewing the writing or how someone conveys their recollections of some aspect of their life, you’re also, in some ways reviewing the life lived. That makes me uncomfortable. Who am I to judge? Who am I to traipse through a writer’s memories. They’ve chosen to expose themselves, yes, but have they chosen to have that exposure dissected?